Good things first: the desk top holder works like a treat; the mini desk stand and stylus also work great; the clear case is fine though bulky and takes away from the beauty and light weight of the phone; the screen protectors are useless as they are a dust magnet and before you have managed to put them on they pick up dust in the air and can't form a neat bubble free cover; the carholder is not very effective - The suction part is useless and the sticky part comes off with the slightest rise in temperature or in sunlight. I would not recommend at all. 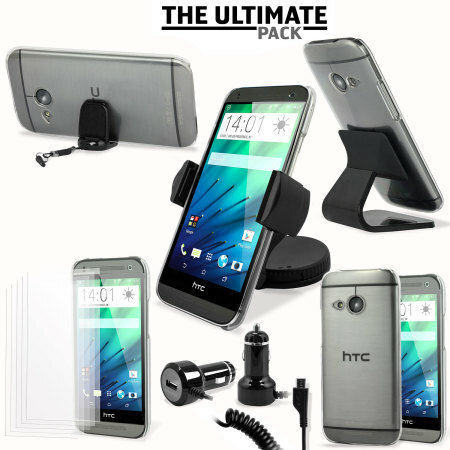 All you ever wanted or needed for your HTC One mini 2. Nothing more, nothing less. All the items in this pack fit and work perfectly with the phone. Nothing in the pack that you wont use one way or another. Custom fit basic case, plenty of screen protecter sheets supplied that were easy to apply. Plus stand for home, holder for car and in car charger. A great value pack. Delivered quickly as well.